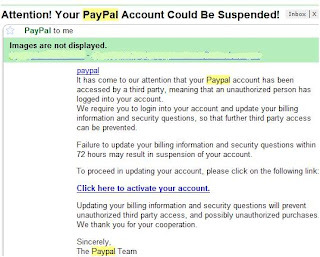 Learn about Paypal Phishing attack to hack Paypal account password. Recently paypal phishing attack has shown a shocking boost,Paypal phishing is increasing day by day.so i thought to make a post tohelp you prevent,Paypal Phishing attack to hack Paypal account password. "At PayPal, protecting your account's security is our top priority. Recently, PayPal members have reported suspicious-looking emails and fake websites. These emails are not from PayPal and responding to them may put your account at risk. Please protect your PayPal account by paying close attention to the emails you receive and the websites you visit. If you think that you have received a fraudulent email (or fake website), please forward the email (or URL address) to spoof@paypal.com and then delete the email from your mailbox. Never click any links or attachments in a suspicious email." 1. Paypal emails are always calling you by your name and not by stupidity like "Dear Paypal user" or so. 2. They never ask you to download any software or assignment. 3. Even you get such emails which might appear to be truly convincing real email... always check the link you are going to click. This is most important. Because that link may contain a phisher for you. 4. And the last one always open in new browser and only then try to login and not by link provided in the email. i am trustworthy man and sir i want keep relationship long ( forever ) with you because you are golden Han for me.